Product #21211 | SKU 483934 | 0.0 (no ratings yet) Thanks for your rating! 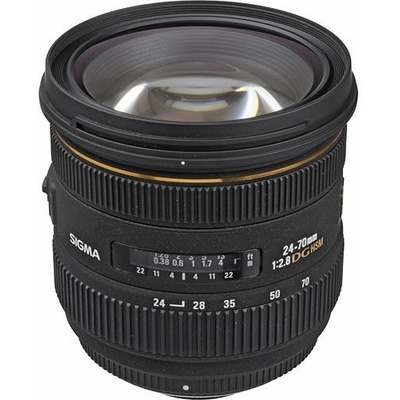 The 24-70mm f/2.8 IF EX DG HSM Lens from Sigma is a go-to option for many photographers thanks to a versatile zoom range from wide angle to telephoto. This model is designed for Sony A-mount cameras and features a fast constant aperture of f/2.8 for shallow depth-of-field and enhance low-light imaging capabilities. The lens provides good image quality through the use of three aspherical elements, one ELD element, and two SLD elements to combat aberrations and distortion. Also, a Hyper Sonic Motor provides fast and quiet autofocus and the lens is designed to do all focusing internally. Additionally, the lens has a front filter thread of 82mm and a rounded 9-blade diaphragm.